STORRS - In some ways, Brice McAllister came home in January. “Yeah, back to the 413,” McAllister says with a laugh, referring to Western Mass’ area code. But this weekend represents another homecoming for the East Longmeadow native and former Suffield Academy football star. 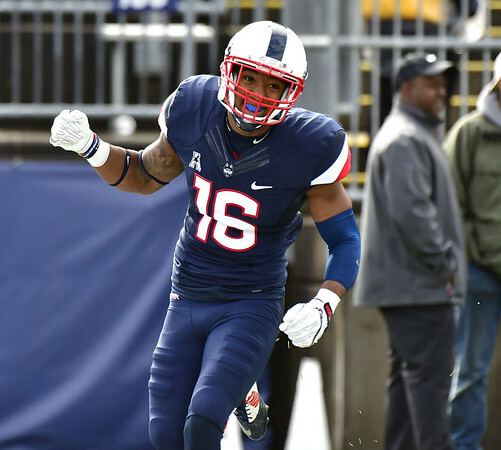 McAllister, a defensive back who spent the last four years at UConn playing for the Huskies, is now a graduate student at UMass and key contributor on the Minuteman football team. Saturday, McAllister is headed back to the 860 as UConn (1-6) hosts UMass (2-6) at Pratt & Whitney Stadium. McAllister had plenty of positive things to say about the Huskies and his time in Storrs. “I’ve definitely kept tabs on them. And I still talk to some of the players and they text me with updates and questions,” McAllister said. Likewise, McAllister’s former teammates expressed thanks for McAllister’s friendship and were looking forward to reuniting this weekend. But despite the pleasantries between the players, there is still some confusion about who did the breaking up and when McAllister and UConn split up. UConn coach Randy Edsall said Tuesday that the decision to leave was made by McAllister. “He decided to leave the program,” Edsall said. McAllister implies that he was told his scholarship was not being renewed. Apparently, there is a little truth on both sides. McAllister, who played in 33 career games for the Huskies, broke a bone in his hand early in the 2017 campaign and the last game he played for UConn was Oct. 6, 2017 against Memphis. The surgery to repair the injury and the ensuing rehabilitation might have, perhaps, taken the remainder of the season. McAllister wanted to apply for a medical redshirt for 2017 and return to UConn for a post-graduate season. The UConn coaching staff felt McAllister was able to return for the final game or two of the 2017 season. So, ultimately, McAllister chose to leave UConn and play a post-graduate season at UMass. Edsall didn’t exactly ask McAllister to leave, but he didn’t want him back on his terms, either. In early November McAllister applied for a waiver to be released from his scholarship for the spring semester and the request was granted by UConn the following day. There aren’t really hard feelings, however. Both sides have moved on. McAllister said he talked with Anthony Watkins, another UConn safety who transferred to Wagner with eligibility remaining, and others before realizing the move was perhaps best for him. Another former UConn defensive back recruited by former coach Bob Diaco, Aaron Garland, also left the program after last season, another sign that Edsall was determined to completely rebuild the secondary. McAllister’s UMass career started with a bang. He had two interceptions in his first game for the Minutemen, returning one 60 yards for a touchdown as UMass pounded Duquesne in its opener. “It was definitely a good start,” McAllister said of his two-INT game. He’s third on the team in tackles with 45, though UMass has hit a rough patch as a team. The Minutemen have lost three straight, including a 24-13 setback to Coastal Carolina last weekend. The latest defeat wasn’t all bad, however, McAllister points out. “Defensively that was probably the best game we’ve had,” he says. Wash out or Wash in? UConn backup QB Marvin Washington, who was not allowed to travel last week to the Huskies’ game in Tampa, practiced with the Huskies as normal Tuesday. Edsall hinted that his absence last week was disciplined for being late to a team meeting. Asked if Washington will play this week, Edsall said it’s up to the redshirt freshman. “If he doesn’t show up for a meeting or if he’s late, then he won’t. As of (Tuesday), he will. But we’ve got Wednesday, Thursday and we have Friday to go yet,” Edsall said. WR/KR Quayvon Skanes injured his right shoulder last week and Edsall said he would miss the next three weeks. … WR Hergy Mayala (cold symptoms) did not practice Tuesday but Edsall said he’d likely practice today. … TE Tyler Davis, DT Kevin Murphy and CB Jeremy Lucien returned to practice after suffering minor injuries last week. Lucien and Ryan Carroll will compete for a starting spot this week. … David Pindell has already set a UConn single-season record for rushing yards by a quarterback with 686. Pete Petrillo ran for 676 in 1967. … UConn and UMass have played 72 times previously, including in three different centuries. UMass leads the series, 36-34-2. Posted in Newington Town Crier, UConn on Wednesday, 24 October 2018 20:16. Updated: Wednesday, 24 October 2018 20:19.